The July meeting was well supported with 28 people attending to hear Consultant Clinical Oncologist Dr Fiona Mckinna provide an update on the new Radiotherapy Centre at Eastbourne District General Hospital. Dr Mckinna is the Lead Clinician for the Cancer Directorate at the Sussex Cancer Centre. Unfortunately, work has yet to recommence since it was ‘mothballed’ in December 2015 when funding was delayed. A further meeting in the next few weeks should confirm the ‘Guaranteed Maximum Price’ but there is now likely to be a shortfall of several hundred thousand pounds for the project. Consequently, it is unclear when the centre will be ready to commence radiotherapy treatments in 2017. Men will continue to be treated in Brighton in the interim. Simon Whiffin, senior lecturer at the School of Health Sciences, University of Brighton has built a new website for the group. He came along to the July meeting to demonstrate the site and its features which incorporates Twitter and Facebook streams. 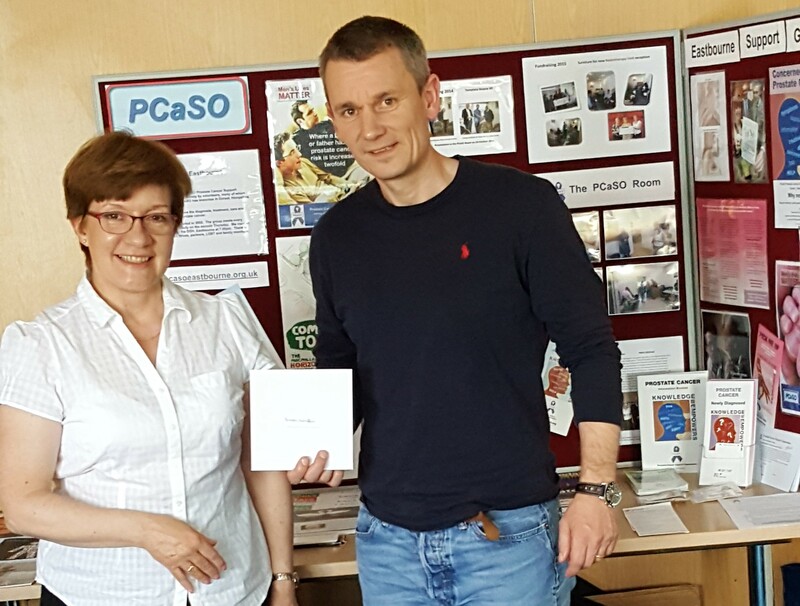 The picture shows Simon with Debbie Hatfield, one of the co-organisers of the Eastbourne support group, thanking him for his work on the website.